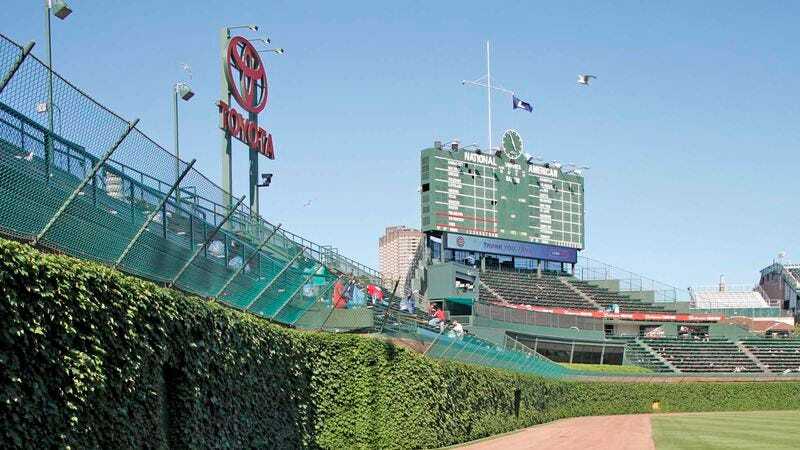 CHICAGO—After taking a tour of the franchise's home stadium Monday, new Chicago Cubs president Theo Epstein told reporters he was revolted the team played in a stadium so run-down a landscaper had to be hired to cut down the thick carpet of weeds growing all the way up the outfield walls. "That hunk-of-junk scoreboard in center is apparently broken—they change the numbers by hand—and I don't even know if this place has electricity," Epstein said while directing workers to tear down the field's dangerous brick boundaries. "If this is the way they take care of their ballpark, I'm not surprised they never put together a winning team here." Epstein went on to say he is already planning to build a "proper, modern stadium" for the Cubs next to Woodfield Mall in nearby Schaumburg, IL, and hopes to have Wrigley Field demolished as soon as possible.